This post first appeared at Inside Higher Ed. Tom Daccord and Justin Reich, founders of EdTechTeacher say it best, “Technology should be used in the service of learning.” It is with this philosophy in mind, that Maria Maldonado, a practicing Physician Assistant and Instructor at the Keck School of Medicine at the University of Southern California (USC) Physician Assistant program, chose to re-examine how iPads were being used for teaching and learning in her curriculum. She saw the ubiquity of technology use for her students and recognized that they learn differently today. Maria decided to begin with an upcoming module on endocrinology that in years past she noticed had been challenging for students. Prior to endocrinology, the modules focus predominantly on one system, however endocrinology requires them to integrate both new and baseline information from the multiple systems they have studied thus far. When I sat down with Maria to discuss how we could enhance the curriculum using technology in the service of learning, we didn’t begin by looking at apps or looking at devices. Rather the conversation began by examining what we wanted students to know and what skills we wanted them to acquire as they prepare to go into the field. She saw the possibilities for creating personalized learning experiences that would empower students to make thinking visible and for creating environments where rich discussions through team-based learning would challenge students to think critically. Instead of creating learning experiences that centered on rote memorization of information, we decided to take a flipped approach to the course creating time in class for hands-on learning activities. Using iBooks Author as our platform, we began creating the content. By re-examining what learning looks like at home and at school, an in-class environment was created that fostered peer to peer education. It is through this process that students are learning to learn, becoming self-sufficient and resourceful which ultimately allows them to understand how to identify their own strengths and weaknesses. Redesigning this module opened up class time to place students in the driver’s seat, allowing them to take on the role of the physician assistant by examining interactive patient cases to test their mastery of the content. Authenticity is an important part of any design, and instead of just writing out a case study, we wanted to emulate the real life patient – PA experience as much as possible with voice and visuals. 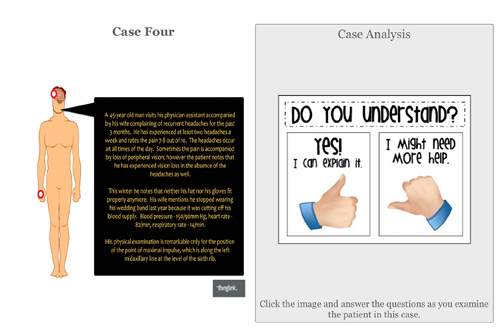 Students then completed a case analysis chart using Google Docs, embedded within the iBook, that had a series of questions and then required them to present their diagnosis along with any further tests that they may order. Bridging the gap between the health professional and the patient by making health education visible is an important part of the learning process in PA education. As students demonstrated their diagnosis, they used an app called DrawMD . By integrating this element into the activity, students are able to learn digital professionalism and etiquette in using mobile devices for patient education in the field. Enhancing the curriculum with technology and introducing students to a new tool was very well-received. Having students share these experiences led them to realize the significance of learning to learn, moving them away from the traditional instructor-centered learning environment, and creating opportunities for them to take ownership of their own learning. The interactive iBook allowed the students to understand how to leverage the different modalities that suit their learning style, and using that feedback encouraged the instructors to further personalize the learning experience. Using this information, students were able to identify their strengths and weaknesses to focus their studying, allowing them to achieve higher results on their exam. “Having another way to individually interact with it, was much like being in the office and having the patient look at me wanting answers. This makes me realize my weaknesses and allowed me to then study those areas further,” said Paige Squiller. ​Millennials are known for having short attention spans, desiring immediate feedback, loving multimedia, and having a strong desire to be entertained by lectures. Innovative use of technology can transform teaching styles to capitalize on these characteristics. In an era where change is rapidly impacting all fields, learning how to learn-to-learn provides students with the confidence and skills needed to be a health professional in the 21st century. Sabba Quidwai is Director of Innovative Learning at the Keck School of Medicine of the University of Southern California (USC). She will be leading workshops in Los Angeles and the San Francisco Bay Area this summer!